A Late Saxon and medieval church that contains a remarkable series of late 11th century wall paintings. The church was built in the late 11th century, and the present nave, which contains a large quantity of reused Roman material, dates back to this period. The wall paintings were discovered in 1996 and are one of the most complete sets of early medieval wall paintings in Britain, as well as being one of the most lavish and sophisticated. In the mid 12th century a south aisle was added to the church, but this was demolished in the 14th century when a number of other alterations took place, including the insertion of a large window with Decorated tracery. The west tower was constructed in the 15th century, and in 1760 the original chancel was replaced. The church was abandoned in the 1930s and fell into neglect, but has been recently rediscovered and restored. In 2000 an excavation carried out by the NAU revealed the foundations of the church and the original chancel, and a second excavation in 2001 revealed a number of burials around the church. Fragments of Iron Age, Late Saxon and medieval pottery have been found in the churchyard. The parish church of St. Mary is a Grade I Listed Building located on the northeast corner of the former village of Houghton-on-the-Hill (NHER 4630). It is constructed of flint and partly rendered, with brick and limestone dressings (S1). It is generally agreed that the nave, which features Roman brick and double-splayed windows (see S13), was constructed in the 11th century (S1-S3, S9). S. Heywood (S9) has proposed six phases for the building. He dates the construction to about 1090 and describes the early church as a two-cell building consisting of a nave and unusually long chancel with lower walls than the present building and a steeply pitched roof. This assumes an earlier date for the chancel than Batcock (S3), who describes it as a likely 13th century addition. Heywood's second phase (S9) proposes that around 1150 a south aisle was added (based on the presence of a blocked two-bay arcade in the south nave wall) and a doorway was inserted in the north wall. During the 14th century (phase 3) several alterations took place, including demolition of the south aisle, insertion of a large window with Decorated tracery at the east end of the north nave wall, heightening of the nave walls, erection of a parapet at the west end of the nave, and construction of a stoop adjacent to the north door (S9). Phase four, dated to the 15th century, is represented by the construction of the tower. This agrees with Batcock (S3), but others have dated the tower to the 14th century (S1). The chancel was replaced with a small altar chamber during the post medieval period (Heywood's Phase 5, 18th century). Bryant dates this work to the 17th century (S4) but Blomefield (S5) describes a chancel matching the full length and width of the nave in the 18th century and the faculty of 1760 includes a request to dismantle and re-build a smaller chancel. The nave roof was re-erected during the mid to late 19th century, Heywood's phase 6 (S9). This was a reed thatch roof (S5) and Bryant (S4) records that it was constructed in 1895, following insertion of the tower's west window in 1857. The church was used regularly until about 1945 (S3). It was out of use by the time of Cautley's 1949 survey (S6), and by 1953 had fallen into disrepair (S7). Restoration work by the Norfolk County Council began in 1993, and in 1996 falling plaster revealed wall paintings on the nave walls (S8 and S9). Further examination revealed that several large areas of early medieval figurative wall painting in the Romanesque style have been preserved. The paintings may be contemporary with the nave (about 1090), which would place them as some of the earliest surviving in England, but could be as late as 1120-30 (S10). The paintings contain several extremely rare features, including what may be the earliest example of a Gnadenstuhl Trinity (S10). See (S10-S12) for further analysis of the paintings. The interior features exceptional wall paintings dating to between AD 1090 and the 17th century (S1). See (S1-13) for further details. H. Hamilton (NLA), 29 May 2008. A. Whittingham believes the fabric of the nave, mid-wall slab, external quoins, and double splayed windows in the north and south walls are mid-11th century. An earlier edition of Pevsner (S14) calls these windows Norman, as he does the unmoulded chancel arch with "shapeless" niches to each side. The church also features and unbuttressed west tower. The chancel was replaced by a small chamber. Bryant states that this occurred in the 17th century (S4). E. Rose (NAU), 16 June 1982. A photographic survey of the ruined church was undertaken by Hallam Ashley of the NMR. The photographs reveal that the exterior is totally covered in ivy except the west door, which is Perpendicular style with a straight head and spandrels. The tower arch is in the Decorative style, but in Norfolk features in this style and the Perpendicular style may have been in use at the same time and therefore the tower could date to the same period as the door. The west window is not clear. There is a simple door to a brick spiral stair. The north nave doorway is blocked and only the northeast nave window is visible. There are traces of Perpendicular or Decorative tracery. The roof is constructed like a barn. The interior is currently full of rubbish and H. Ashley has reported evidence of digging within the chancel. See (S15) for further details. 1990. Site Visit and Documentary Research. The nave windows were blocked during later alterations and only reopened in 1889. Other alterations to the nave include adjustments to the doorways and insertion of a large window near the east end of the north wall in the early 14th century. Deterioration has continued and it is described as being in dangerous condition. In 1990 no glass remained in the windows, no roof remained on the tower, large holes were present in the nave roof, and window tracery and ledger slabs had been broken, exposing burial vaults open in places. The church was restored as part of Norfolk County Council's 5-year Ruined Churches Programme. The ivy was removed from the building by cutting the stems and allowing the plant to die naturally. The roofs of the nave and chancel were repaired, the north doorway was restored, and the top section of the east nave gable was rebuilt. Lost quoins were rebuilt in tile, cracks were repaired, and re-pointing was carried out in selected locations. The three large windows were filled with honeycomb brickwork in order to provide security against vandalism and protect the interior from the elements. The parish hopes to raise finds to roof the tower and reinstate the floors in the future. In 1996 extensive wall paintings were discovered following a fall of plaster from the nave wall. The paintings include a Christ in Majesty and may date to the 12th century. It has been reported that while removing a tree the original chancel foundations were uncovered, recorded, and re-buried, but this has not been substantiated. Rough indications of its location can be seen in the turf of the churchyard, and a geophysical survey has been recommended. See (S10) for further details. March 1993. Casual Find. Context 4 . An end scraper, a piercer, four retouched flakes, and two core fragments were recovered, all dated to the Neolithic. May-August 1993. Casual Find. Context 5 . 9 sherds of unglazed medieval pottery and 2 unidentified sherds were recovered. A detailed inspection of the church fabric was carried out during restoration work. At the time of the survey ivy had been removed from the south wall of the nave but not from the tower. Dating evidence noted during this survey agrees with earlier interpretations, assigning a Late Saxon or Saxo-Norman date. Two periods of work may be indicated by a change in fabric in the northwest quoins, but this may simply be a structural feature. The date of the tower could not be refined any further than 14th-15th century, but it was confirmed that it was constructed against a pre-existing west nave wall. An item described as a 10th century limestone bowl was reported as having been stolen from the church. This likely refers to the medieval piscina. See addendum to (S1) for further details. May 1996. Casual Find. Context 2. Several pottery sherds were recovered on the south side of the church from mole hills and bare soil patches. These have been identified as an Iron Age sherd, a possible sherd of St Neots ware, four early medieval unglazed sherds including two of pimply Harling type, and a Grimston sherd with a handle scar. Information from addendum to (S1). November 1996. Casual Find. Context 3. Additional pottery was recovered from bare soil to the south and southwest of the church. These have been identified as two unglazed medieval sherds and an Iron Age sherd. February 2000. Trial Trenching. Contexts 4 -97. Evaluation trenching as part of a programme of repair work being carried out by the The Friends of St Mary's. Revealed foundations for the nave and chancel, and nave floor. See report (S16) for further details. This work is also summarised in (S21). D. Gurney (NLA), 21 August 2000. Red paint was observed on the broken surface of the former stone impost of the chancel arch, revealed underneath fallen plaster from the north western corner of the arch at springing point. It had been previously thought that the impost was cut back when the new chancel was built in the 18th century. The presence of paint on the cut impost requires further investigation. The fallen plaster also revealed the soffit of the original arch, which had been adjusted when the new chancel was constructed. The original arch appears to have been horseshoe shaped. See (S17) for further details. H. Hamilton (NLA), 30 May 2008. January/February 2001. Excavation. Contexts 201 to 244. Excavation of trenches and soakaways revealed burials, the Roman tile copping of the nave foundations and the probable remains of the south aisle wall. 2 probable Iron Age pottery sherds were also found. See report (S22) for further details. This work is also summarised in (S23). D. Gurney (NLA), 19 April 2001. 2004. Surface finds in churchyard on south side of church. Late Saxon/Medieval and medieval sherds. A. Rogerson (NLA), 20 November 2004. July-September 2006. Watching Brief. Contexts 300-320. Monitering of the excavation of cable trenches through the churchyard. Revealed seven burials, six of which were articulated east-west lying skeletons. A small quantity of pottery sherds and a smoothed, incised object identified as a post medieval bone or ivory key cover for a keyboard instrument were also found within the trench. Roof tiles and iron nails also found. All human skeletal remains were re-interred at the locations they were discovered, at a slightly greater depth below the new cable conduit. See report (S24) for further details. J. Allen (NLA), 25 May 2007. See (S19) for restoration work on wall paintings. J. Allen (NLA), 6 September 2006. Article from SALON 156 (S20) added to file. E. Darch (NLA), 15 January 2007. --- Aerial Photograph: 1977, 1984. TF8605A, B(? ), C, G, H.
--- Newspaper Article: Lynn News. 1998. Rare paintings at 'lost village' attract hundreds. 13 October. --- Monograph: Brown, G. B. 1903. Anglo-Saxon Architecture. The Arts in Early England. Vol II. p 204. --- Aerial Photograph: Edwards, D.A. (NLA). 1996. TF 8605ABX. --- Newspaper Article: Eastern Daily Press. 2003. No end to the church flooring dispute. 21 March. --- Newspaper Article: Eastern Daily Press. 2003. Now church's south window in frame. 9 October. --- Aerial Photograph: CUCAP. 1956-1961. TF 8605ADB-ADF. --- Newspaper Article: Lynn News. 1997. Derelict church's wall paintings on national TV. 10 January. --- Newspaper Article: Eastern Daily Press. 1998. Bob really earns glory for church. 24 November. --- Newspaper Article: Lynn News. 1996. Satanists blamed for church attack. 27 August. --- Newspaper Article: Eastern Daily Press. 1996. Bob's a dazzler at the church. 10 June. --- Unpublished Document: Watts, D.S.. 2004. St Mary's Church, Houghton-on-the-Hill, Norfolk: Specification for Conservation of Nave Wall Paintings and Wall Plaster. December. --- Unpublished Document: NAU. 1997. St Mary's Church, Houghton-on-the-Hill, North Pickenham, Norfolk. Project Design. June. --- Photograph: Watt, D.. 1994. St Mary's Church, Houghton-on-the-Hill, Norfolk..
--- Unpublished Document: Penn, K.. 2000. St Mary's Church, Houghton-on-the-Hill. Potential for future work.. May. --- Unpublished Document: Watts, E. 1999. St Mary the Virgin, Houghton-on-the-Hill, Norfolk. January. --- Newspaper Article: Eastern Daily Press. 1992. Devil worship alert after grave robbed. 4 July. --- Newspaper Article: Lynn News. 1994. Church robbed of £20,000 artefact. 1 July. --- Newspaper Article: Eastern Daily Press. 1992. Vigil to trap devil-worshippers. 7 July. --- Newspaper Article: Lynn News. 1995. The Heavens Open. 9 June. --- Newspaper Article: Lynn News. 1996. How were bricks pushed outwards?. 9 August. --- Newspaper Article: Eastern Daily Press. 1996. Church treasure house of art. 30 December. --- Newspaper Article: Eastern Daily Press. 1997. Lottery plea to save church art. 1 January. --- Newspaper Article: Lynn News. 1997. History Books Rewrite After Church Art Find?. 3 January. --- Newspaper Article: Church Times. 1997. Uncovering the mercy-seat. [unknown]. --- Newspaper Article: Eastern Daily Press. 1997. Roman link with ancient church. 30 April. --- Newspaper Article: Lynn News. 1997. More discoveries at church?. 6 June. --- Newspaper Article: Lynn News. 1997. Royal visit to local church. 5 August. --- Newspaper Article: Lynn News. 1997. £300,000 to save rare church treasures. 12 September. --- Newspaper Article: Eastern Daily Press. 1998. Signs of life in the lost village. 16 March. --- Newspaper Article: Eastern Daily Press. 1998. Historic church in line for top honour. 9 November. --- Newspaper Article: Eastern Daily Press. 1999. A crusade against the Devil's own work. 14 August. --- Newspaper Article: Lynn News. 2000. New secrets unearthed. 25 February. --- Newspaper Article: Eastern Daily Press. 2000. The church of secrets. 25 February. --- Newspaper Article: Eastern Daily Press. 2000. Medieval wonders of church wall. 15 September. --- Newspaper Article: Eastern Daily Press. 2006. Restoration uncovers a treasure. 6 September. --- Photograph: Ratcliff, M.. 2006. LXV. --- Unpublished Document: Heywood, S.. Historic building report for St Mary (Houghton-on-the-Hill), North Pickenham, Watton, Norfolk..
--- Newspaper Article: Eastern Daily Press. [unknown]. Labour of love. [unknown]. --- Newspaper Article: Lynn News. 1998. Church restoration ranks alongside Windsor Castle. 24 November. --- Unpublished Document: Harbord, R.. 2007. St Mary the Virgin Church, Houghton-on-the-Hill, Norfolk.. June. --- Photograph: 1993. St Mary's Church, Houghton on the Hill. Print. --- Photograph: 1992. St Mary's Church, Houghton on the Hill, July. Print. --- Photograph: 1997. St Marys Church, Houghton on the Hill. Print. --- Photograph: Photographs of St. Mary's Church, Houghton-on-the-Hill, North Pickenham. Black & white. --- Newspaper Article: Eastern Daily Press. 2012. Can you help holy mission to keep St Mary's open?. 10 April. --- Monograph: Taylor, H.M. and Taylor, J.. 1978. Anglo Saxon Architecture.. SIII. --- Archive: Clarke, R. R. and NCM Staff. 1933-1973. Norwich Castle Museum Record Card - Late Saxon. Pickenham (North). --- Slide: Various. Slide. 344-366. --- Newspaper Article: Eastern Daily Press. 1997. Helping to save church ruins (letter to the editor). 5 February. --- Newspaper Article: Eastern Daily Press. 1996. Church attack puzzle. 9 August. --- Monograph: Messent, C.J.W.. 1936. Parish Churches of Norfolk and Norwich..
<S1> Archive: NAU Staff. 1974-1988. Norfolk Archaeological Index Primary Record Card. <S2> Photograph: Heywood, S.. 1995. St Mary's Church, Houghton-on-the-Hill, Norfolk..
<S3> Monograph: Batcock, N. 1991. The Ruined and Disused Churches of Norfolk. East Anglian Archaeology, 51. Microfiche 5:G12. SVII/ p 51, fiche. <S4> Monograph: Bryant, J.. 1900. Norfolk Churches.. SV/. <S5> Serial: Blomefield, F.. 1807. An Essay Towards a Topographical History of the County of Norfolk.. Vol VI. vol VI. <S6> Publication: Cautley, H. M. 1949. Norfolk Churches. p 211. <S7> Newspaper Article: Eastern Daily Press. 1953. 9 May. <S8> Unpublished Document: Rose, E.. 1994. Building Report..
<S9> Unpublished Document: Heywood, S. 1996. Church of St Mary, Houghton-on-the-Hill, North Pickenham, Norfolk. <S10> Unpublished Document: Rickerby, S.. 1996?. The Church of St Mary, Houghton-on-the-Hill: Conservation of Wall Paintings. <S11> Unpublished Document: Carrington, D.. 1996. Preliminary Survey of the Interior Wall Paintings at St Mary the Virgin, Houghton-on-the-Hill. <S12> Article in Serial: Heywood, S.. 1997. Romanesque Wall Paintings discovered in Norfolk.. Minerva. Vol 8.2, pp 8-9. pp 8-9. <S13> Unpublished Document: Heywood, S.. 2000. Church of St Mary Houghton-on-the-Hill. Romanesque double splayed windows..
<S14> Serial: Pevsner, N. & Wilson, B.. 1989. The Buildings of England. Norfolk 2: North-West and South..
<S15> Photograph: Ashley, H.. 1982. St Mary's Church, Houghton-on-the-Hill. Print, b&w. NK6413-NK6419. <S16> Unpublished Contractor Report: Penn, K. 2000. 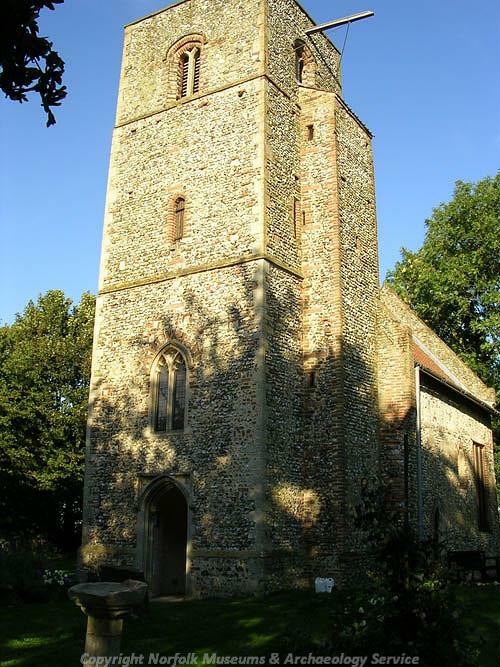 Report on the Archaeological Evaluation at St Mary's Church, Houghton-on-the-Hill, North Pickenham, Norfolk. Norfolk Archaeological Unit. 497. <S17> Unpublished Document: Heywood, S.. 2000. Chancel arch at St Mary, Houghton-on-the-Hill..
<S18> Monograph: Friends of St Mary's. 2007. Church of St Mary, Houghton-on-the-Hill..
<S19> Newspaper Article: Eastern Daily Press. 2006. [unknown]. 2 September. <S20> Serial: 2007. SALON 156. 15 January. <S21> Article in Serial: Gurney, D. and Penn, K. (eds). 2001. Excavations and Surveys in Norfolk 2000. Norfolk Archaeology. XLIII Pt IV pp 707-728. p 718. <S22> Unpublished Contractor Report: Penn, K. 2001. Report on the Archaeological Excavation at St Mary's Church, Houghton-on-the-Hill, North Pickenham. Norfolk Archaeological Unit. 585. <S23> Article in Serial: Gurney, D. and Penn, K. (eds). 2002. Excavations and Surveys in Norfolk, 2001. Norfolk Archaeology. Vol XLIV Pt I pp 162-177. p 169. <S24> Unpublished Contractor Report: Ratcliff, M. 2007. An Archaeological Watching Brief at St Mary's Church, Houghton on the Hill, North Pickenham.. NAU Archaeology. 1206.